* all weights determined by re entering figures into an Excel spreadsheet 10th Sept 2013 PDH. Looking at the engraved Trophies. P Hoy 5th, Dave Cass 4th, Paul A Kilpatrick 3rd, Ian Russell 2nd and Denis Thompson 1st. But, the weights in the spread sheet as above (checked twice show John Messenger as 4th) no mention of John Messenger on any of the placed Trophies. 6th and 7th Trophies have no engraving. John Messenger is correctly engraved on the F Kirk. Singles Knockout winner - Paddy Hoy (from Trophy). Doubles Knockout winners - Dave N Perrett & Brian Harland (from Trophy). Heaviest Fish in a competition - John Messenger - 10 lb 05½ oz (2nd October 1988). Heaviest Fish out of competition - Paddy Hoy - 7 lb 06 oz (dated between 4th & 11th December 1988). Christmas match winner - Paul A Kilpatrick 4 lb 05 oz - 2 fish (wed 21st Dec 1988). Christmas match Heaviest Fish - Dave Cass - 2 lb 04 oz (wed 21st Dec 1988). Greatest number of fish - Denis Thompson - 75 fish**. Heaviest Bag of Fish - Denis Thompson - 20 lb 10 oz (30th Oct 1988). 1st - N Inglis - 19 lb 03 oz - 16 fish. 2nd - P Hill - 14 lb 04 oz - 12 fish. 3rd - D Middlemas - 4 lb 03 oz - 3 fish. Total weight for the season - 1,203 lb 05 oz. Total Number of fish - 574**. **note Sunday 30th Oct 88, Sunday 13th Nov 88 (Filey Open) & Sunday 26th Feb 89, there are no records for numbers of fish caught. Notes:- PDH from ledger 14/12/2012. 28th September 1988 - Paul Kilpatrick flounder 1 lb 04 oz. 23rd October 1988 Hayburn Wyke - 16 members fished - nothing caught!!! 26th October 1988 - John Messenger Heaviest Fish 10 lb 05½ oz. - Les Spedding whiting of 1 lb 05 oz. 23rd November 1988 - Bob Eglon 1 fish for 8 lb 01 oz. 27th November 1988 - Blue Star. 18th December 1988 - Eric's Open. 27th December 1988 - Boulby Open. 15th January 1989 - Cloughton Open. 22nd January 1989 - Bell Trophy. 1st February 1989 - Ian Russell Tadpole fish 0 lb 13 oz. 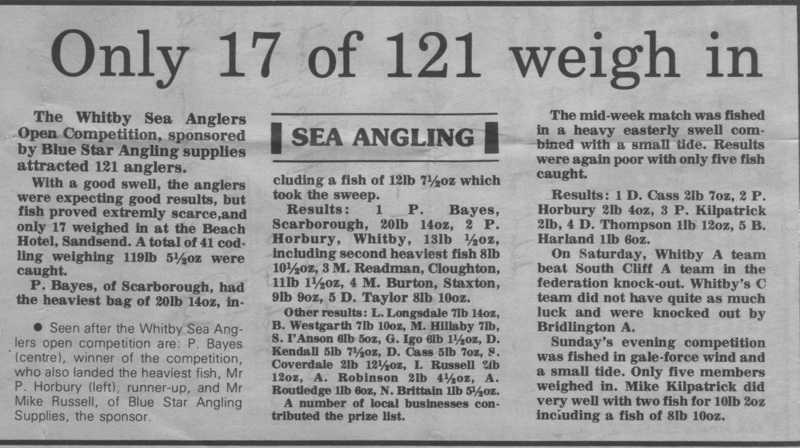 Between 4th & 11th December 1989 - Paddy Hoy Heaviest Fish out of a match 7 lb 06 oz. 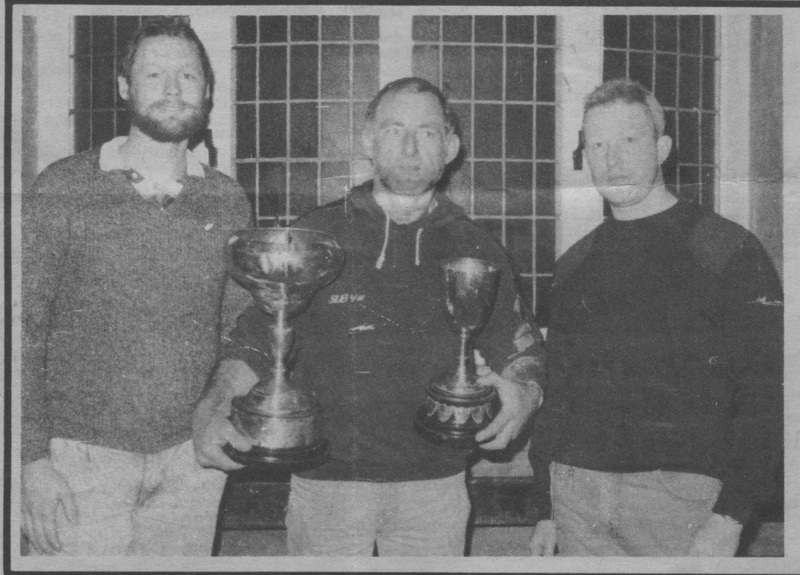 The Northern federation of sea Angling 1988/89 Inter-Club team Knock-Out champions are Whitby SAC 'A'. 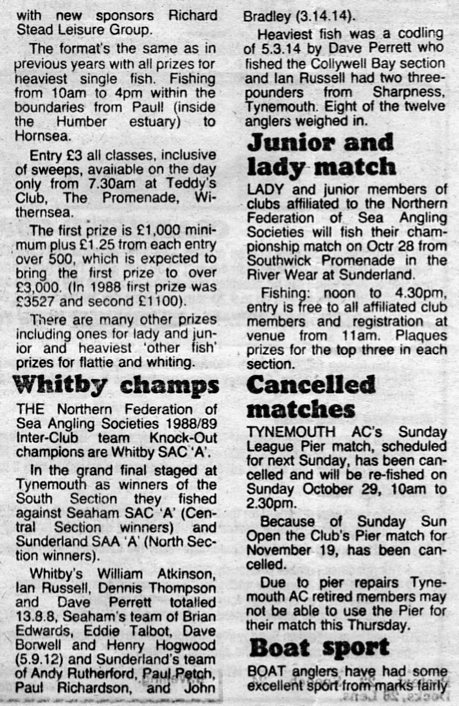 In the grand final staged at Tynemouth as winners of the South Section they fished against Seaham SCA 'A' (Central Section winners) and Sunderland SAA (North Section winners). Whitby's William Atkinson, Ian Russell, Denis Thompson and Dave Perrett totalled 13.8.8, Seaham's team of Brian Edwards, Eddie Talbot, Dave Borwell and Henry Hogwood 5.9.12 and Sunderland's team of Andy Rutherford, Paul Petch, Paul Richardson, and John Bradley (3.14.14). Heaviest fish was a codling of 5.3.14 by Dave Perrett who fished the Collywell Bay section and Ian Russell had two three pounders from Sharpness, Tynemouth. Eight of the twelve anglers weighed-in. Courtesy of William Atkinson, Chairman of Whitby Sea Anglers Association, from his personal collection of press cuttings. Thanks also to the Sunday Sun. Posted 12/04/2013 PDH. 11th N Brittain with 1 fish for 1 lb 00 oz. 16th D Middlemas (Jnr) with 1 fish for 1 lb 3/16oz. 11th = J Hewitson with 1 fish for 1 lb 00 oz. 8th M Kilpatrick with 1 fish for 10/16oz. 9th L Spedding with 1 fish for 1 lb 1/16oz. 8th P Hoy with 1 fish for 15/16oz. 6th P Hoy with 1 fish for 1 lb 9/16oz. Match 8 - Hayburn Wyke. 2nd J Messenger with 1 fish for 10 lb 5 1/2 oz* Heaviest Fish. 12th W Atkinson with 1 fish for 1 lb 9/16oz. Leader Board after 9 matches. 5th J Hewitson with ? fish for 1 lb 4/16oz. 14th D Thompson with 1 fish for 1 lb 5/16oz. 10th D Perrett with 1 fish for 14/16oz. 12th J Messenger with 1 fish for 1 lb 00 oz. 11 seniors and 2 juniors fished - 6 weighed in. 6th J Messenger with ? fish for 2 lb 11/16oz. 3rd L Spedding with 2 fish for 3 lb 2/16oz. 10th P Kilpatrick with 1 fish for 11/16oz. 15th P Kilpatrick with 1 fish for 14/16oz. 19 members fished, 4 weighed in. 4th N Brittain with 1 fish for 1 lb 6/16oz. *note Sunday 30th Oct 88 & Sunday 13th Nov 88 (Filey Open) there are no records for numbers of fish caught. 5th B Harland with 1 fish for 1 lb 6/16oz. 5th P Hoy with 1 fish for 1 lb 14/16oz. 11th L Spedding with 1 fish for 2 lb 4/16oz. 7th N Inglis (Jnr) with 1 fish for 10/16oz. 10th P Kilpatrick with 1 fish for 10/16oz. 18 members fished and 8 weighed in. 8th D Perrett with 1 fish for 1 lb 1/16oz. 1st P Kilpatrick with 2 fish for 4 lb 5/16oz - Heaviest bag of Fish. 2nd = D Cass with 1 fish for 2 lb 4/16oz - Heaviest Fish. 5th B Harland with 1 fish for 12/16oz. 4th P Kilpatrick with 1 fish for 8/16oz. 6th I Russell with 1 fish for 1 lb 12/16oz. 4th P Kilpatrick with 1 fish for 1 lb 3/16oz. 12 members fished and only 3 weighed in. Match 29 - Cloughton Open. 3rd D Thompson with 1 fish for 1 lb 04 oz. 4th B Vasey with 2 fish for 1 lb 5/16oz. 14 members fished and only 3 weighed in. Sun 22 Jan 89 - Bell Trophy. 3rd D Cass with 1 fish for 1 lb 12 oz. 3rd B Vasey with 1 fish for 1 lb 7/16oz. 4th B Vasey with 1 fish for 7/16oz. 2nd I Russell with 1 tadpole fish for 13/16oz. 7th J Hewitson with 1 fish for 1 lb 15/16oz. 6th W Atkinson with 1 fish for 9/16oz. 6th P Kilpatrick with 1 fish for 8/16oz. 2nd P Kilpatrick with 2 fish for 4 lb 4/16oz. 2nd D Perrett with ? fish for 2 lb 15/16oz. 5th P Kilpatrick with 1 fish for 1 lb 7/16oz. Match 45 - no one weighed in. 3rd M Kilpatrick with 1 fish for 2 lb 1/16oz. 3rd D Thompson with 1 fish for 1 lb 7/16oz. Match 48 - no one weighed in. 3rd N Brittain with 1 fish for 7/16oz. *note Sunday 30th Oct 88, Sunday 13th Nov 88 (Filey Open) & Sunday 26th Feb 89, there are no records for numbers of fish caught. Completed 10th Sept 2013 PDH. Last edit 24th Feb 2014, 8th March 2014, 15th March 2014.